It's a quirk of filmic fate that one of Steven Spielberg's biggest and most beloved blockbusters is the one that was never intended to be a blockbuster. E.T. The Extra-Terrestrial, was meant to be anything but; a small, intimate film about childhood, loss, and loneliness. It was borne of Spielberg's frustration on the set of his most overt blockbuster (up to that point) Raiders of the Lost Ark and inspired, in part, by Francois Truffaut's suggestion during filming of Close Encounters of the Third Kind that Spielberg make a film about kids. French New Wave influence? Loneliness? Loss? How ever did this film become the biggest hit of the 1980s? The truth is, Spielberg simply can't help but make blockbusters. Whether it's Jaws, Raiders, Jurassic Park, The Adventures of Tintin, or (you'd expect) the forthcoming adaptation of Roald Dahl's The BFG, blockbusters are as much a part of Spielberg's being as his very flesh and blood. Even when he tries to tread a different path, he somehow ends up gravitating towards blockbuster box office receipts. He tackles the Holocaust in Schindler's List, it makes $321m. He films one of the most unsettling depictions of war in cinema history in Saving Private Ryan, it makes $481m. He strips away all the masterful visuals we've come to expect of him in Lincoln, it makes $275m. It’s not a bad problem to have, but it represents something of a curse when it comes to critical respect. 'Blockbuster' is a four-letter word not even The Wolf of Wall Street dare utter. It's low, crass, somehow simply not art. If film is about creativity and self-expression, the blockbuster is about money and self-obsession. Try to define the genre and you're likely to find only financial parameters. A film is a blockbuster if it has a big budget, an even bigger marketing plan, and a yet bigger still box office. It's why films as disparate as E.T., Titanic and The Expendables 3 can all be given that very broad blockbuster tag. There's not a thematic, narrative, or visual link between those films. The only thing that binds them is money. And to most, that's the only thing that matters in the bloated world of the blockbuster. 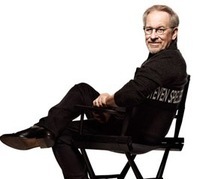 For Spielberg, the blockbuster is something more; it's a chance to join the masses together in a single, shared moment. Speaking of Indiana Jones and the Temple of Doom, Spielberg said in 1984: "It's a group experience for large numbers of people sitting in movie theatres, not for two or three people sitting in front of the television at home. You need to feel the audience clapping and laughing and yelling and screaming in order to get the total effect of the Indiana Jones saga." The same could be said for Jaws, Jurassic Park and Close Encounters. If you've ever had the pleasure of seeing those films on the big screen, you'll see what Spielberg means. That T-Rex doesn't roar quite as majestically on the small screen as it does the big. 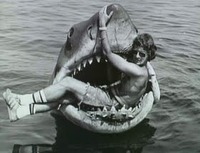 Cinema needs Spielberg, but Spielberg needs cinema. This reliance is coded into most of Spielberg's films, and pretty much all his blockbusters. Think of the crowds of people who gather at the end of Close Encounters and Schindler's List, or the familial harmony achieved come the conclusions of Jurassic Park and E.T.. For Spielberg, a happy ending is one dominated by throngs of people gathered in awe around a single point of interest, be it a brightly lit spaceship, a repentant businessman, or a marauding Tyrannosaur. These objects reflect the cinema screen, another single object being gazed at by massed onlookers. The film therefore becomes a mirror and the communal experience is expanded. We see in ourselves the plight of the characters on-screen. They become us and we become not just passive viewers but active participants in the film. This sense of community is by no means always a good thing though; Spielberg is as adept at scaring as he is at enchanting. Consider the panicked masses in Jaws, flooding out of the ocean, crushing their fellow bathers as they go. The trip through a Shanghai tipping into war in Empire of the Sun, when young Jim looks on, unable to comprehend the chaos he sees. Or the suburban refugees in War of the Worlds, attacking Ray Ferrier and his children for possession of their car. When community is broken, when bonds are replaced by fear, graphic horror breaks free and the entertainment we expect is gone. Again, symbols of cinema play a talismanic role. Note how Spielberg focuses on the car windows in Empire and Worlds as a surrogate cinema screen separating the characters from reality. The horror of the world outside literally smashes up against it, and in the case of War of the Worlds, tears its bloody way through. The delicate balance between fear and wonder, and the role they play in binding or breaking community in Spielberg’s blockbusters, is expressed with particular eloquence at the end of Raiders. It’s another crowd of people and another point of interest, though in this case even the staging and placement of the actors seems designed to replicate cinema. Centre stage are Belloq, Toht, and Dietrich, the film’s three villains who are ready to prize the Ark open and unleash its power. Watching them are Nazi soldiers, loaded with cameras and lights, recording the moment. And tucked away at the back are Indy and Marion, tied to a post, unable to stop the ritual. Actors, crew, audience, all gathered to witness the wonder - the Ark another cinema stand-in. But wonder quickly turns to fear and the only ones who survive are those who know to look away. The blockbuster is power; it can bind, it can break; it can draw in, it can destroy. Abuse it at your peril. Such smart visual techniques for drawing viewers into, and commenting on, the communal power of the blockbuster seem to be dwindling. All blockbusters seek to immerse the audience in their world, of course, but the emphasis is much more on narrative than visuals these days. This is the key to the success of the Marvel Cinematic Universe. No film is an island; indeed no character is an island any more. Events in Captain America: The Winter Soldier don’t just impact upon Captain America 3, but Agents of SHIELD, Avengers: Age of Ultron and, considering the magnitude of the events in The Winter Soldier, the whole of Phase 3. If a reality of a film series is judged on narrative cause and effect, the Marvel films teem with a verisimilitude unrivaled in blockbuster film-making. Yet, there's something curiously unsatisfying about Marvel’s approach. Immersive narratives work as well on the small screen as the big; indeed, they may even work better in that environment, where you can pause Man of Steel to spot the Wayne Enterprises logos or Iron Man 3 to get a good look at the Hulkbuster armour. It’s a sadly solitary endeavour where the communal experience takes place in small groups spilling out of the cinema screen, or in online conversations between LokiLover92 and SuperJuan19. There’s nothing wrong with that - as a frequent Twitter user, it’s something I myself enjoy - but it at least partially nullifies the blockbuster and the unique communal pleasures it brings. Spielberg's brand of big, immersive, unmistakably visual blockbusters are unique then. Some shining beacons remain, in the grandeur of the Smaug sequences in Desolation of Smaug, the wordless, music-driven finale of Super 8, and the teasing delivery of the eponymous monster in Gareth Edward’s recent take on Godzilla. Tellingly though, they’re made by directors who have either worked with or are openly working under the influence of Spielberg. He remains a touchstone, perhaps the touchstone, for the modern blockbuster. And why shouldn’t he be? In the 39 years since he almost inadvertently created the genre with Jaws, Spielberg has moulded it into something truly meaningful. Not just a cash cow ready to be milked, but that beautiful thing one can only get at the cinema: a shared dream, where we all clap and laugh and yell and scream together. This article was published on August 20, 2014.